The National Leader of All Progressives Congress (APC), Asiwaju Bola Tinubu, Governor Abiola Ajimobi of Oyo State, two other governors and other chieftains of the party yesterday formally received the immediate past governor of the State, Adebayo Alao-Akala, former Senate leader, Senator Teslim Folarin and other top politicians to the APC. The rally was to also celebrate the 68th birthday of Governor Ajimobi. 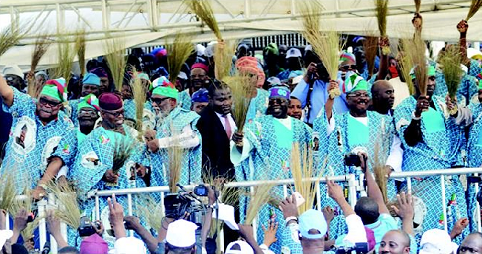 Addressing the huge crowd of party supporters and others who defied the scorching sun to witness the event, Tinubu said the APC has all it takes to accommodate the political heavyweights joining its fold. Other defectors were a former Secretary to the Oyo State Government, Ayodele Adigun, the immediate past PDP State Chairman, Yinka Taiwo and five Accord Party members in the state House of Assembly. Also joining the APC were former Speaker of the state assembly, Ashimiyu Alarape; a former member in the House of Representatives, Kamil Akinlabi; a former Chairman of Oluyole Local Government, Kehinde Olaosebikan; Senator Brimoh Yussuf; former PDP woman leader, Mrs. Olanrewaju Otiti, Folake Olunloyo, Rauf Olaniyan, Lukeman Oorelope and Kemi Jaiyeoba, among others. Hmm it is a serious matter. I hope to recover my past losses from this one Ooooooooo. I tried it with small money but still won something.